Ryan left to go on the road this past Wednesday, which means that I went from cooking for three hungry baseball players and myself to just myself :(. Insert pity party here. Cooking for one is so much harder than cooking for a big group. You either have to decide to eat the same thing over and over again, or you have to very creative about mixing and matching ingredients. With the chilly weather outside, I decided to take the middle approach: make soup. Soup is my perfect lunch or start to a dinner. You can fill it up with tons of vegetables (and use up ingredients in the frige) and create a very easy, balanced meal. Over the past two days I’ve made soup and chili, eaten one bowl for lunch, put one in the fridge, and the rest go in individual containers in the freezer. Super easy for the next week (or two depending on how often I’m craving it!). 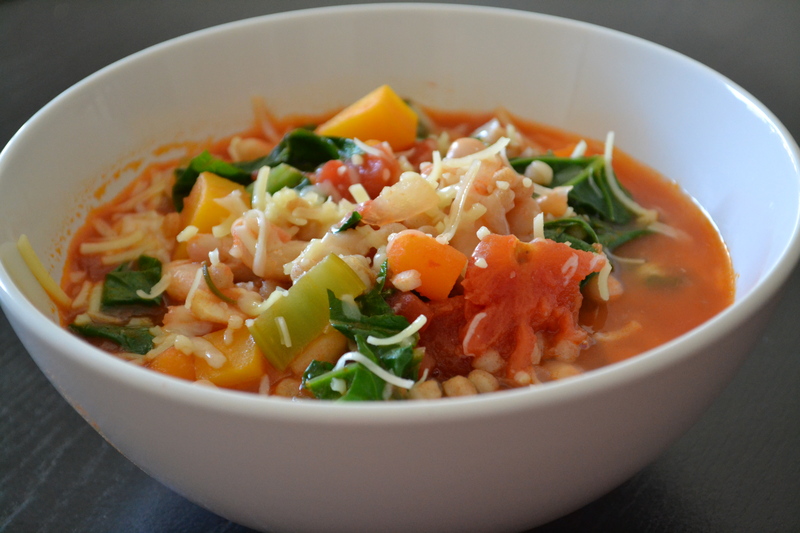 I decided to up my vegetable content after our drive north by making this classic Italian Minestrone Soup. I tend to think of Minestrone as a vegetarian soup, but most recipes use pancetta for that salty, rich flavor. For my blog, if something should be a vegetarian recipe, I tend to keep it vegetarian so there are no surprises. But if you want to add a little diced pancetta at the beginning of the recipe, or use chicken stock instead of vegetable stock, it will certainly add more flavor to the mix. To substitute for those rich flavors and keep the soup vegetarian, really saute the carrots, celery, and onions until they are caramel in color. It will develop the flavors and make it taste excellent. A little comfort food to welcome me to our new apartment while Mr. Baseball is on the road. Heat a large soup pot over medium-high heat with a drizzle of olive oil. Add the onion, celery, carrots, garlic, and butternut squash. Saute for 4-5 minutes, or until the onions become translucent and very fragrant. Add the rosemary, thyme, and cannellini beans; saute another 3-4 minutes or until the rosemary and thyme are fragrant. Add the tomatoes, stock, cous cous, and greens. Cover and bring to a low simmer. Cook for 20 minutes. Season to taste with salt and pepper. Serve with a bit of Parmesan over top. I LOVE minestrone. It’s so easy to pull together with a variety of vegetables and herbs that may be laying about the house and it’s always so satisfying! I like the use of butternut squash in yours!